Awards Gallery - LifeWave, Inc. Welcome to the LifeWave Award Gallery, which features the recognition we have been honored to receive over the years. Click on the images below for a full view photo of each award. 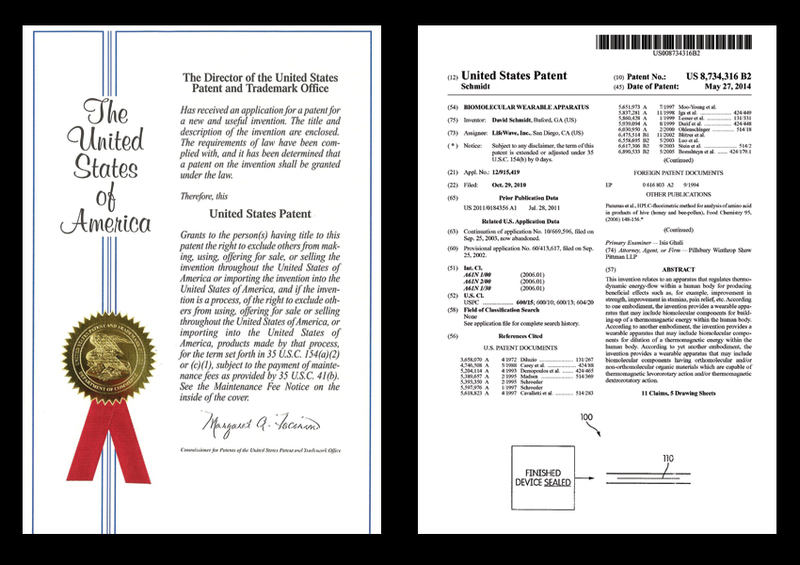 The United States Patent Office has issued an official patent for the Theta One and Theta Activate nutrition technology entitled “Nutritional Product Composition for Increasing Human Growth Hormone and Nitric Oxide Production.” This issuance of our patent for Theta technology guarantees the exclusivity of this “feel it within minutes” breakthrough in the nutrition industry. Theta One and Theta Activate are LifeWave’s approach to rapidly elevating nutrients in the body to dramatically improve quality of life. 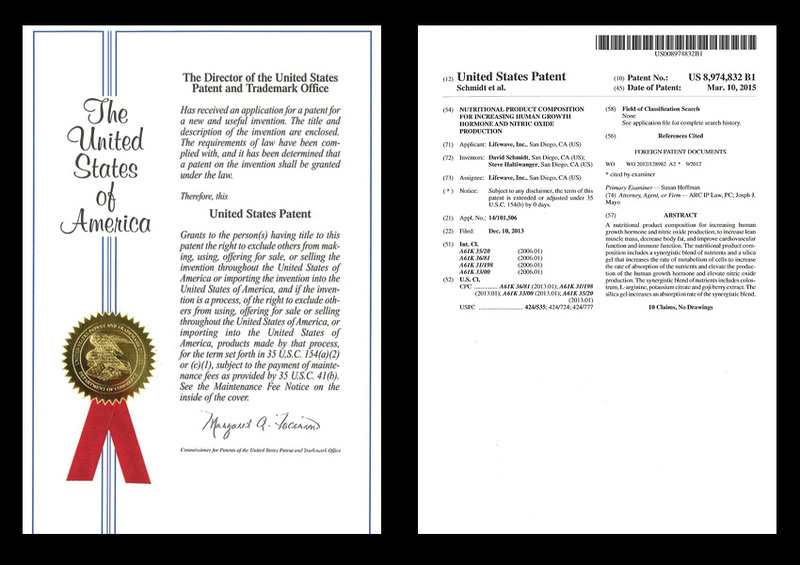 The United States Patent Office (USPTO) has now officially issued the foundational LifeWave Technology patent entitled “Biomolecular Wearable Apparatus.” After a thorough review of our scientific and research data, the USPTO determined that the LifeWave Technology is valid and novel, and on that basis issued this patent. 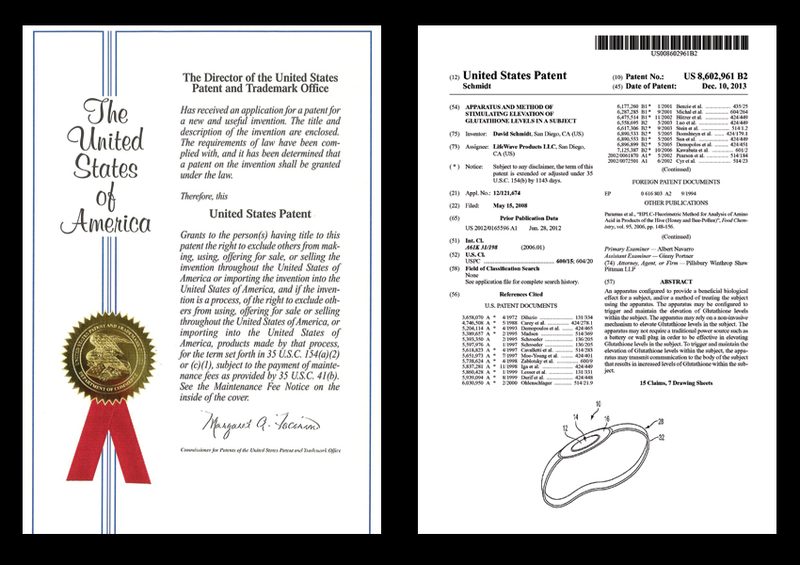 The United States Patent Office has officially issued a second patent that provides further coverage of the LifeWave Technology. This marks an important benchmark in advancing the efficacy and validity of LifeWave, and is an extraordinary accomplishment for all of those who make up our growing community. 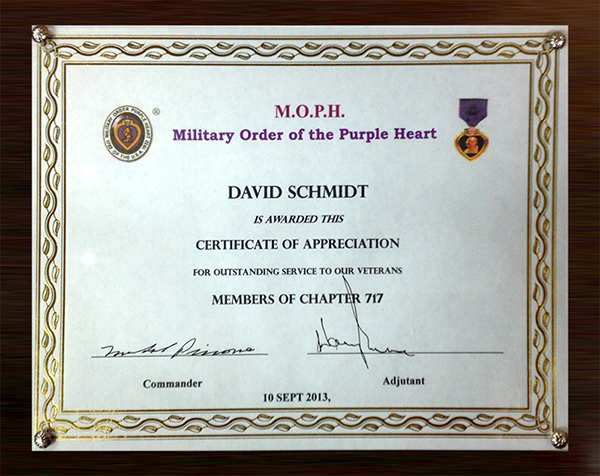 LifeWave Founder/CEO David Schmidt received a very special award from the Military Order of the Purple Heart! 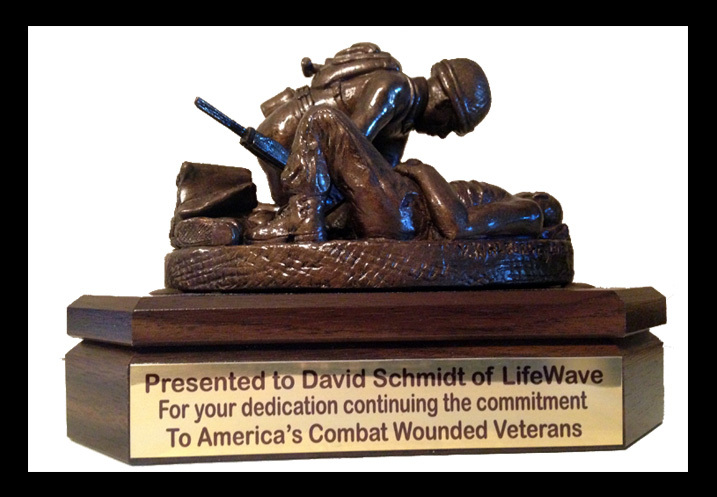 David was presented with a statue of a Naval Corpsman attending to the wounded, which symbolizes help given to the suffering during crucial moments of need. This was the first presentation of the award in the history of the MOPH, and David is extraordinarily honored to be chosen as the inaugural recipient of this very special honor! LifeWave was honored by the Military Order of the Purple Heart (MOPH) for work the company has done to help alleviate pain and suffering for Veterans. The MOPH is a wonderful organization composed of around 45,000 military men and women who received the Purple Heart Medal for wounds suffered in combat. The MOPH is devoted to fostering an environment of goodwill and camaraderie among combat wounded veterans, promoting patriotism, supporting necessary legislative initiatives, and most importantly, providing service to all Veterans and their families. LifeWave is proud to be recognized by such a profoundly important organization. 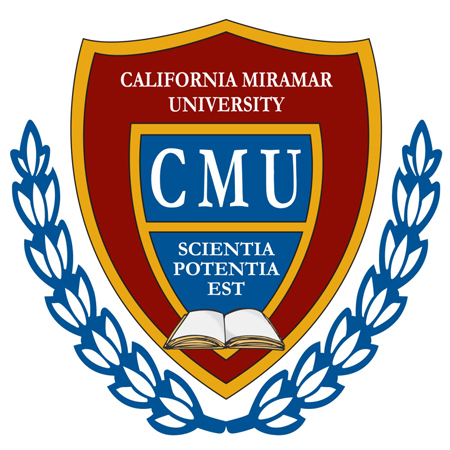 California Miramar University recently honored LifeWave, Inc., with its "Small Business Spotlight Award." CalMU chose LifeWave because of the company's global presence in over 100 countries, the fact that LifeWave products are helping people across the world improve their quality of life, and that "LifeWave has truly cornered a segment of the health market because THEY have created it." CalMU was also impressed with LifeWave's business model, history and accolades. LifeWave is proud to be recognized by such a well-established university and right in LifeWave's hometown of San Diego, California. 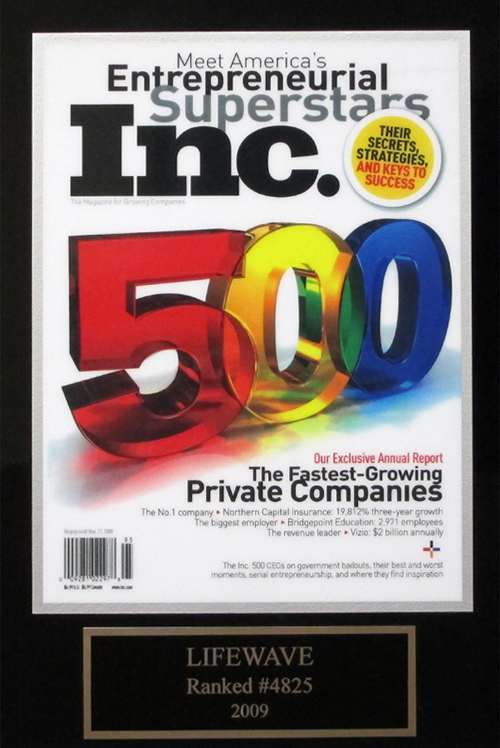 In August 2011 Inc. Magazine announced that LifeWave once again earned a spot on the Inc. 5000 ranking of fastest growing private companies in the United States. This is the third consecutive year that LifeWave has made this prestigious and well-recognized list. This time however, LifeWave reached into the top 1,000 coming in at an amazing number 721. 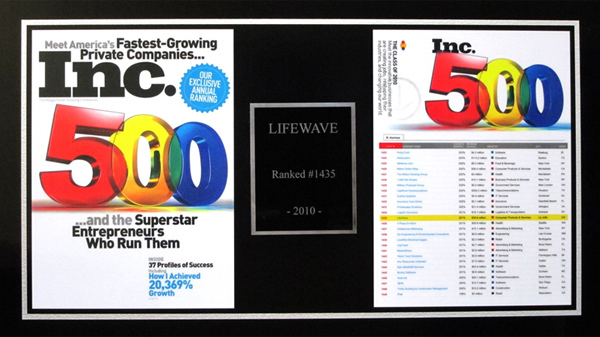 LifeWave first made the Inc. 5000 list in 2009 earning a ranking of 4825 and was featured again in 2010 moving up to an incredible 1435. The 2011 achievement of earning spot number 721 is a true landmark in the company's history. 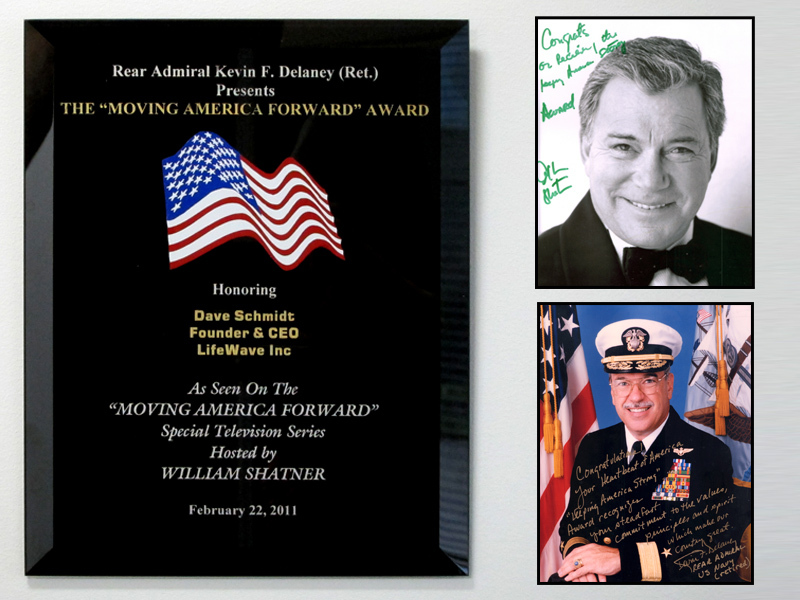 In January 2011, LifeWave had the honor of being selected for a feature on Moving America Forward, a nationally-aired news television program in the United States hosted by an international celebrity and icon, William Shatner. Moving America Forward highlights entrepreneurs and organizations whose products and services contribute to the progress of the nation. 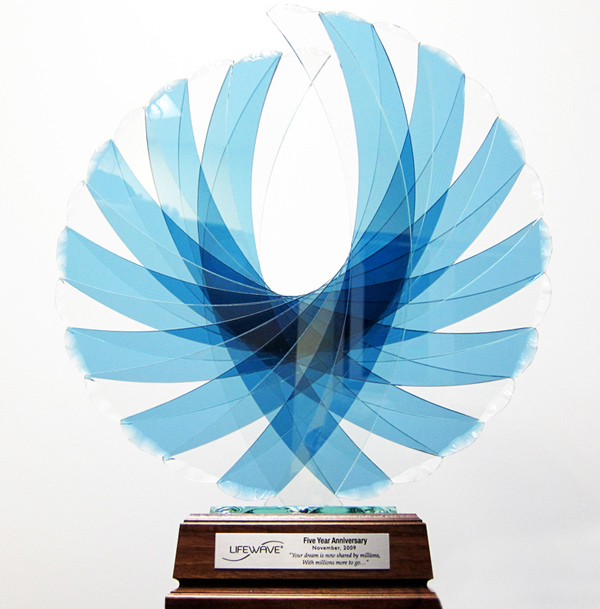 During the segment, LifeWave was recognized with the "Moving America Forward" Award. Inc. Magazine's annual ranking of fastest growing companies is a well-recognized and comprehensive listing of rapidly developing private companies in the United States. 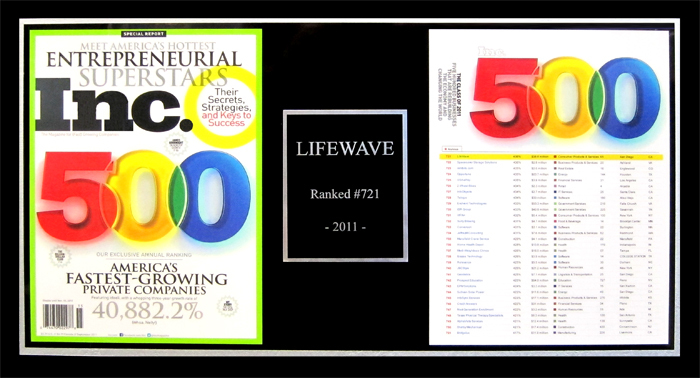 For two years in a row, in 2009 and 2010, LifeWave had the distinction of being named to this prestigious list. Not only that, but in 2010, we jumped a whopping 3,390 spots from the previous year to number 1,435. From November 10-14, 2009, LifeWave celebrated its five-year anniversary in style – with an unforgettable Caribbean cruise. On the last day of that journey, LifeWave staff members, with the enthusiastic support of the entire field, presented David Schmidt with this striking commemorative crystal sculpture. Inc. Magazine's annual ranking of fastest growing companies is a well-recognized and comprehensive listing of rapidly developing private companies in the United States. For two years in a row, in 2009 and 2010, LifeWave had the distinction of being named to this prestigious list. In 2009, we were ranked number 4,825. The International Observatory of Discomfort is a society whose mission is to recognize people and organizations who aid in the relief of international suffering. Members of the organization had observed IceWave being used in Italy with remarkable effectiveness. 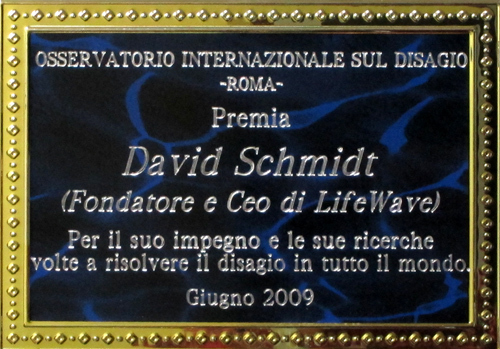 As a result, Professor Angelo Marra, Secretary General of the society, presented David Schmidt with this award in 2009, at the Carrousel du Louvre in Paris, France, for the development of IceWave. In April 2009, the worst earthquake Italy has seen in three decades struck the historic central Italian city of L'Aquila. The disaster killed hundreds, left tens of thousands homeless and injured more than 1,500 people. LifeWave responded by donating patches to help emergency response workers, volunteers and victims cope with the aftermath of this catastrophe. 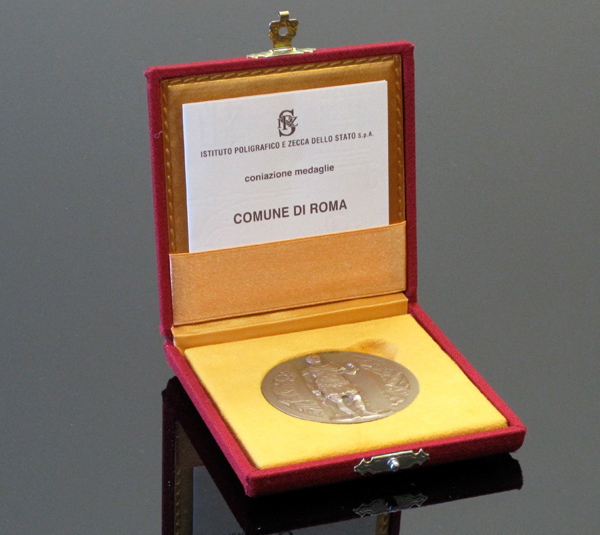 In recognition of LifeWave's efforts, an emissary from the office of the Mayor of Rome presented David Schmidt with this gold coin in front of a crowd of more than 800 who were gathered for LifeWave's open meeting at the Ergife Palace Hotel in Rome on October 25, 2009. The "Cambridge Who's Who" Registry is a detailed compilation of biographies of executives, professionals and entrepreneurs across a wide variety of industries. Inclusion in the registry is limited to individuals who have demonstrated leadership and achievement in their industry and occupation. 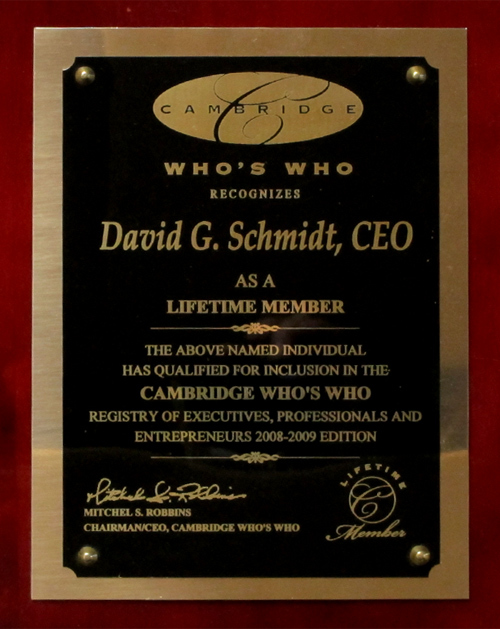 David Schmidt was selected for inclusion in the registry's 2008-2009 edition and was recognized as a Lifetime Member. In 1999, the Award Committee for the International Hall of Fame, sponsored by the Inventors Club of America, selected David Schmidt to receive an Honorary Degree, Doctor of Science and Technology, for his work in the biomedical field as well as his contribution to the research of metal alloys. 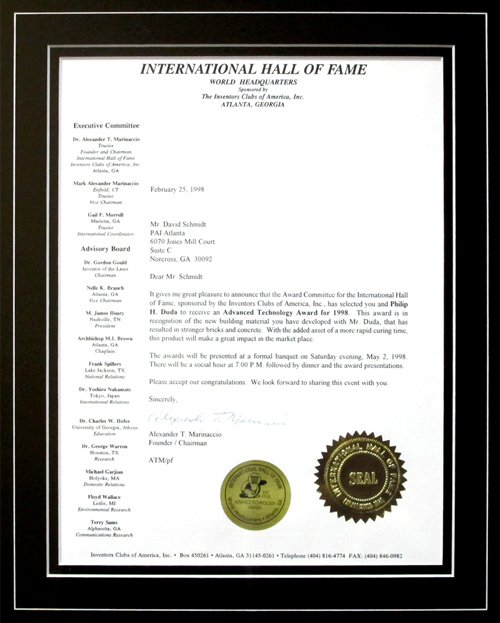 The International Hall of Fame was an organization that was established to honor and recognize exceptional work by inventors. In 1999, David Schmidt was presented with the Advanced Technology Award for the second year in a row. 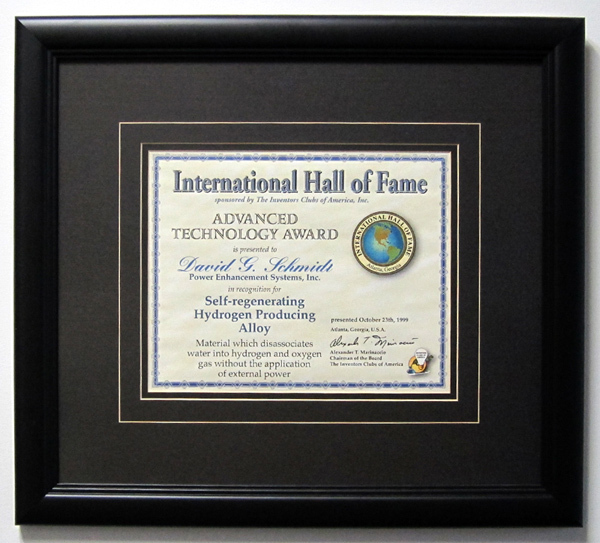 The International Hall of Fame (sponsored by the Inventors Clubs of America) recognized David for his work in developing a metal alloy that served as a catalyst for producing hydrogen and oxygen gas from water – something that had never been done before! 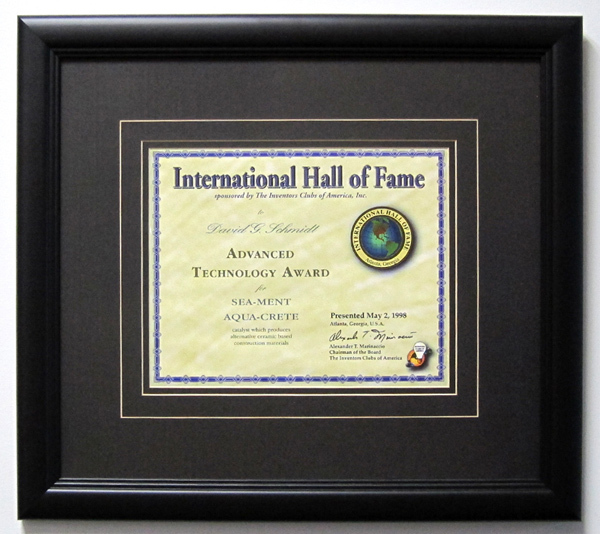 In 1998, David Schmidt was presented with this Advanced Technology Award from the International Hall of Fame (sponsored by the Inventors Clubs of America) for his work in developing a catalyst for accumulating minerals from sea water to form a new type of cement. The novel invention was aptly dubbed "SEA-MENT."